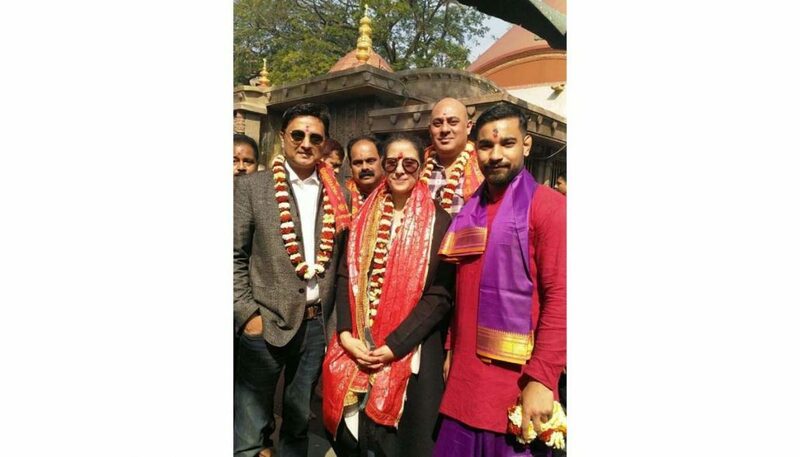 Bollywood actress and cancer survivor Manisha Koiralawho is in Guwahati visited Kamakhya on Monday. The actress took part in the Brahmaputra Literary festival and dedicated her book Healed, to the cancer patients of the Northeast. She also led the Deepsikha Foundation’s Vijay — Walk Against Tobacco and Cancer from Judges Field to Cotton University. Besides Manisha, nearly 50 people, including Deepsikha’s goodwill ambassador and Assamese actress Zerifa Wahid, producer Sahnab Alam, the organisation’s founder chairman Devasish Sarma and its patrons Ashok Sarawgi and Mumbai-based Kailash Gidwania took part in the 1km walk. Manisha’s book, Healed, on her fight against cancer and struggle to return to healthy life was made available for sale at the college, the ongoing Brahmaputra Literary Festival and also at Tochi Raina’s concert at Deepsikha’s fundraiser Preetir Enajori. Proceeds from the book’s sale would go towards Deepsikha’s work for cancer care and awareness, the actress said. The actress, who was diagnosed with ovarian cancer underwent treatment in the US, emerged triumphant after a painful struggle.